Located on a key seafront setting, The Qawra Palace Hotel enjoys a beautiful view of Salina Bay complimented by the scenic promenade. 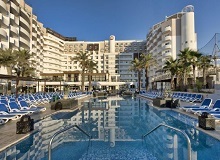 With a focus on service and semi-modern furnishings offering a touch of style and culture, this resort is an ideal choice for couples or families looking for a holiday to remember. 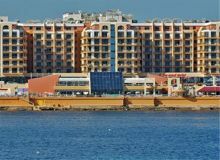 The hotel is in the centre of the wonderful seaside resort of St. Paul’s Bay which was a small fishing village dating back almost 1000 years and is located in the north of Malta close to Qawra. 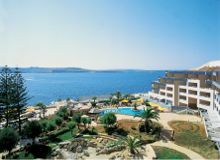 The Dolmen Resort Hotel delivers uncompromising quality while engaging your every mood and aspiration of Malta. Contemporary room design and exemplary standards of service, facilities and cuisine. Enjoy a relaxing break at The Suncrest Hotel. Whether it's just a weekend getaway or a longer holiday we are sure you can find activities to suit your requirements. Most of the rooms have a balcony from which either a land view or sea view can be enjoyed.